I’m really glad that we are providing staff and with a non-marketised social place without any ads or personal data harvesting. Broadly agree – VLEs are not born as social networks but as spaces for designing and running course activities (increasingly social ones) and presenting course information. That said, since you’ve made the case for the new platform by way of negatively contrasting VLEs, and since VLEs are so disparaged these days I’m going to make a brief case for VLEs. First thing – in my experience, whether students can see VLE spaces in which they are not formally enrolled, or whether forums are used is a matter of choice and design rather than software architecture – so in Moodle I’ve seen plenty of open access spaces, and plenty of discussion. The opportunities for assessment feedback in Moodle and Turnitin are very sophisticated now, and are being taken up. When the more social platform (which looks great, by the way) arrives, we will still need spaces for designing and running course activities, managing cohorts, running assessments with contextualised feedback (including for and by groups), letting students peruse other Moodle spaces, and communicate in an academic register. It is this academic register – whether in discussions or the way that a subject area is represented on Moodle – which requires the judicious design, encouragement, modelling from academics. This is a (the?) major difference academics make to (digital) higher education, and it is what animates VLEs in ways which only those who are participating in that course can really know. I take all that on board and I don’t think this does or should replace a VLE. Interestingly Brockenhurst still provide both and allow people to use whichever seems most appropriate for a given task. There is still a value in having a safe space with a group of peers, and it is right that assignments should be private and so on. But I think we can add more to what’s already there, and in a way that many staff and students will find resonates with the systems they already use outside of the university. That’s where our VLE started… in the sense anyone with an account could could access any course/unit. The reality was chaos in a business sense (see Mira’s comments) especially regarding asessment and communication. And it was 10-15 years ago – things change. Closed silos do work well when privacy is required (eg social work) with many shared spaces (eg casting lounge for creatives, law debates page for the legal eagles etc) so we have some of each – but agree, do need more with more control and contribution for the student. One whole school has just started a online personal tutor-easque pilot using e-portfolio as the shared personal space while keeping the VLE for the unit/course organised stuff. Maybe this is a way to go? Hi Paul. Yes, that’s prominent on our feature list, as we want to extend this community to the entire UCL family. Now of course, we don’t have a product yet, so I can’t promise this, especially for the first release. But connecting with Alumni is a big part of the CC, and a big thing for bringing UCL people together so certainly in our requirements. Drop me an email if you want to be involved with the project. Hi Roger. Yes, we are not arguing against silos (aka safe spaces) in general – and of course for some purposes of assessment, for the functioning of quizzes etc they make perfect sense. 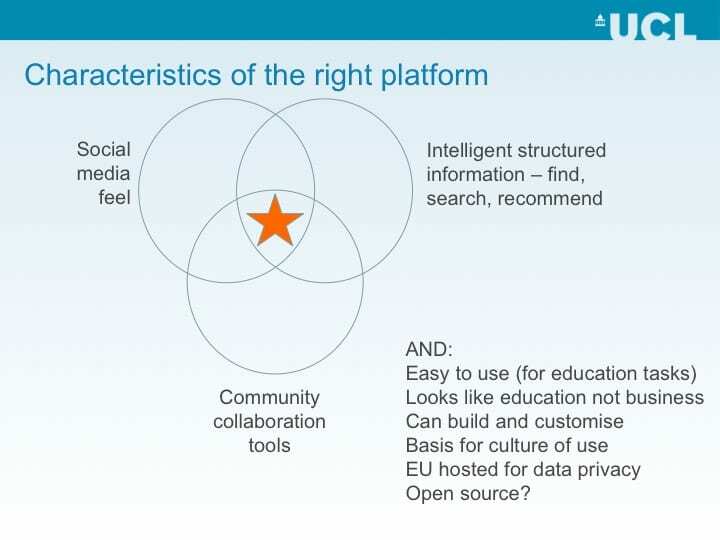 We are not turning off Moodle at all, just observing that a different type of platform is missing and looking to fill that gap. We’ve used Mahara a bit, but like Moodle it is generally perceived as quite clunky. I think the difference is that for Moodle, many tasks that students are asked to do are proscribed, so they do them anyway. It’s a bit like having a clunky expenses system, but I still use it anyway because I want my money back, I don’t have a choice. For social/personal learning systems, there is so much more choice. I think we need to go way beyond functionality checklists to think about what makes a system actually used voluntarily – that will include its look and feel, wording, and whether every user can think that the platform has been made just for them. Didn’t say it was easy! ‘Aula conversational learning environment’. They are being piloted at Oxford University’s Said Business School’.